Dock’s sales portal is a mini-CRM that helps your sales team manage and collaborate on contacts, leads and opportunities. Track every communication from introduction to closure, with Dock’s easy-to-use sales portal including a sales-only calendar and document library. Using SharePoint online, your sales team can access quotes and contracts from any device by accessing the cloud-based employee intranet. 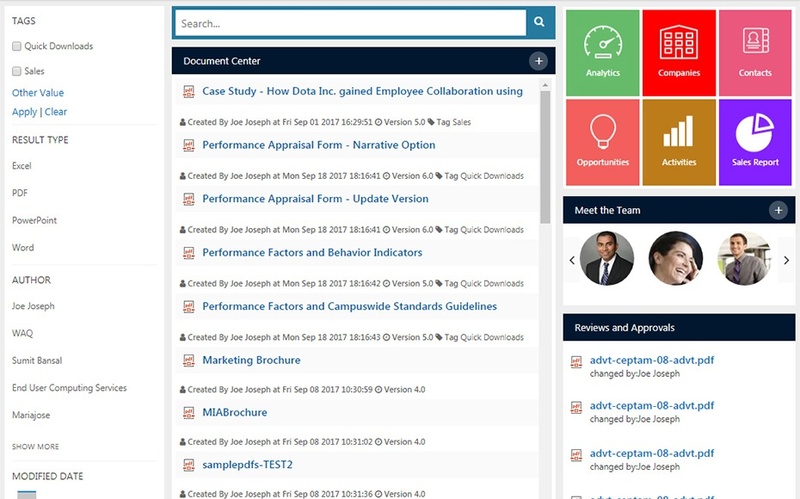 The online collaboration tools will allow your sales teams to work on the same documents to increase productivity, which is one of many advantages to your SharePoint intranet portal benefits. Sales data management is complex but the software to handle it doesn’t have to be. Dock 365 allows you to accurately track sales activities, companies and more. Ready to get started and want to learn more? Book a demo with one of our SharePoint site experts today! Power BI dashboards provide a 360-degree view for business users with their most important metrics in one place, updated in real time, and available on all of their devices. With one click, your sales team can review the data within their dashboard using intuitive tools to make finding answers easy. Our internal app market is where all your integrations will be set up with the applications you’re already using, like SalesForce and Yammer, and then access them right from your home page. We also create custom apps. Learn how easy it is for employee adoption of our mobile app to manage field sales tasks by booking a live demo with our SharePoint experts.